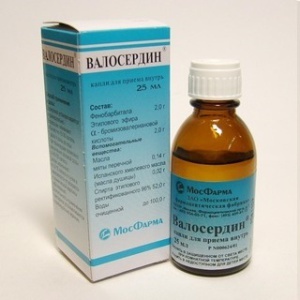 Valoserdine is a sedative combination medicinal drug (antispasmodic), which contains synthesized and herbal ingredients: peppermint oil, phenobarbital, ethyl bromovalerianate, oregano essential oils. 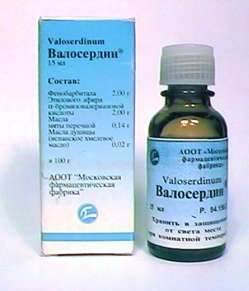 The calming effect of Valoserdin is directed to the internal organs (mainly the heart), relaxation of smooth muscles. It is important to understand that Valoserdin will not cure your heart, but will only relieve some symptoms for a while. If you have heart problems, you need to go to a doctor without delay. Valoserdin is produced in the form of a colorless transparent liquid (there is a specific smell) in glass bottles that have cardboard packaging. The volume of the bottles is 15, 25 and 50 ml. The preparation Valoserdin needs to be accepted inside in the form of drops to food. A single dose is recommended from fifteen drops 2-3 times a day in the case of mild hypertension, insomnia or mild nervous excitement; and up to forty drops in case of vascular spasms. The use of the drug is contraindicated in severe pathologies of the kidneys or liver, individual intolerance to the components of the drug. Also contraindicated for use during pregnancy and lactation. Side effects when using Valoserdin can occur with a systematic overdose, which manifests itself in the form of dizziness, lethargy, drowsiness. When such effects occur, the dose should be reduced to the recommended level. Severe cases of overdose can lead to coma, collapse, respiratory failure, peripheral reflexes, tachycardia. Neutralization of side effects in case of severe overdose is carried out by symptomatic therapy, administration of activated carbon, gastric lavage. Prolonged use of high doses can lead to drug dependence, apathy, depression, hemorrhagic diathesis, conjunctivitis, rhinitis, chronic bromine poisoning. During the period of the drug is recommended to refrain from work associated with increased concentration, the need for speed psychomotor reactions. Operations that are potentially dangerous should be abandoned. During pregnancy and lactation use of the drug is contraindicated . Mint oil is characterized by an antispasmodic and reflex vasodilating effect. Phenobarbital has sedative activity, in certain doses is hypnotic. Ethylbromizovaleanat has a sedative effect, is an antispasmodic and mild hypnotic. Oregano essential oils are characterized by anti-sclerotic, antispasmodic, bactericidal, analgesic, diuretic, sedative, expectorant, anti-inflammatory, antiviral, regenerating action. 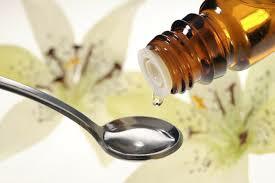 The aroma of oils neutralizes fears and neuroses, soothes, restores the surge of strength. Valoserdine as a combined drug is a means of sedative action, but it does not fundamentally cure heart disease. Methotrexate - Valoserdin increases the toxicity of the first. Anxiolytics, neuroleptics, sedatives - the effect of each is enhanced. CNS stimulants - weakens the action of each. Phenobarbital, which is part of Valelerdine, reduces the antifungal activity of griseofulvin due to deterioration of absorption, the antibacterial effect of sulfonamides and antibiotics, doxycycline, estrogens and other drugs that are metabolized in the liver by way of oxidation, by accelerating their destruction. Ethanol - enhances the action of Valoserdin, but increases its toxicity. It is kept out of the reach of children and sunlight in a temperature range of + 18 to 22 º C.
The shelf life of the drug is 3 years, after the expiration of which use is prohibited. The modern reality of people's life is due to the fact that stress, cardiovascular diseases and muscle spasms become commonplace. Rare people avoid it in their youth, but closer to old age, most begin to experience heart pain and stress. This leads to an increase in the consumption of medications of a sedative effect, including Valoserdin. As a rule, its use precedes the use of more serious medications after a visit to the doctor, when the action of Valoserdin becomes insufficient. For most people, Valoserdin is an effective means of neutralizing the severity and pain in the heart, excessive arousal, and therefore is in a prominent place in the first-aid kit. The drug is often taken with you to work or when leaving the house when a stressful situation is expected. The drug is sold in pharmacies without a prescription. 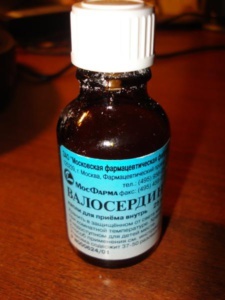 Since the value of Valoserdin is less than Valacardine, the former is widely used and used among a large number of people. This prevalence of the drug allows you to identify a significant number of reviews regarding its use. I have a fast heartbeat, I drink valoserdin. In principle, it helps, the pulse becomes within the normal range. In general, Valoserdin helps to relax, calm down. My job is connected with problem clients, so I can’t do without a sedative, Valoserdin comes in handy. Helps to cope with irritability. And I also noticed that I began to fall asleep better. I have two small children, I was very tired and my nerves were to hell, my husband is constantly on business trips, there are almost no relatives living nearby, only my mother, who works for days, helps rarely, unfortunately. In order not to lose her mind specifically, she decided to go to a doctor that she would advise, some sort of sedative, prescribed valosterine. To my surprise, such an inexpensive tool helps a lot, I become calm as a boa.